modifying the process: part one. Seriously . . . have to find memes where I can, right? I have been almost overwhelmed by the positive words I have gotten from people following the results of my assessment. I had a few comments that I had to shrug off because, like anything, sometimes people really do not understand–that said, I can’t claim to understand everything either. However, now that the results and initial meetings are out of the way, it’s about taking the action to modify the process. This week has been all about seeing that being put into motion. And feeling thankful, grateful for the people around me who are on all sides of making that happen, and helping me to make this transition successful. In reality, it is a continuation of what is going on outside of me, but also a fresh start of what’s going on inside of me. It is knowing that, on the road ahead, that I will have the right things in place. It’s knowing that maybe I might actually have a graduation date in reach. It’s knowing that I can do this, even if I have to do it a bit differently than I have been. Yesterday I wrote my first exam with accommodations. I used a few minutes of my extra time allowance, and the private room was louder than I thought it would be (so, I will probably take them up on the earplug offer next time. Because that is an available service apparently). I was asked if I wanted a clock or time-prompts during the test (they said it was okay to look at my Fitbit, so I declined). Bonus perks: I got a soft spinny chair and a foot rest. I am not joking people. There were also pencils and an eraser provided on my desk which was unexpected, and I forgot my ID in my jacket pocket which was not with me, and somebody on staff at Accessibility Services [AS] just vouched for me. (Also everything is really hush and confidential–considering my entire life is on the internet I am not super concerned about this, but it cracked me up when she whispered “What’s your name again?” and I replied at a normal volume. On the exam-room booking schedule, I was only in there by my initials). After I finished, I went and hung out outside the room my class was writing in (as they were being held captive for a full class period) to snag my friends Courtney and Rachael after the test to see how it went, and my instructor came and asked how things went. The test was harder than we thought it would be, and we all didn’t really study the right stuff, but really, it’s Intro to University. It’s fine! Today I’ve seen things unfolding. After my instructor left the room in Scientific Principles of Fitness and Conditioning this morning so we could fill out course evaluations, I ran into her as I was leaving the building. “You’re Kerri, right?” [Well, something had to do it. My long standing ability of being another non-descript student to a lot of instructors is coming to an end!] “I was just talking to Accessibility Services about getting the course notes document to you–I’ll send you an e-mail later today.” Sure enough, a few hours later I got a couple of Word documents of the course notes popped into my inbox, cc’ed to my Accessibility Advisor, with an apology for things taking so long. After thanking her (and my advisor who is so fabulous), my instructor then asked me if she needed to provide AS with the final exam for me, following which we had some fun back-and-forth e-mails, which was totally unexpected but, once again, very appreciated. I’ve felt grateful. I’ve felt inexpressible appreciation. For all the people in this unexpected journey. For people who are not only helping these things fall into place, but actually wanting to ensure things happen effectively. For people who are going beyond what they need to, especially at this point in the term, to help me. For people who maybe I have had second thoughts about . . . who are now not only doing what they are required to . . . but going beyond that and helping to meet me where I’m at. Staring into the intersection, she thinks that she can fly, and she might. 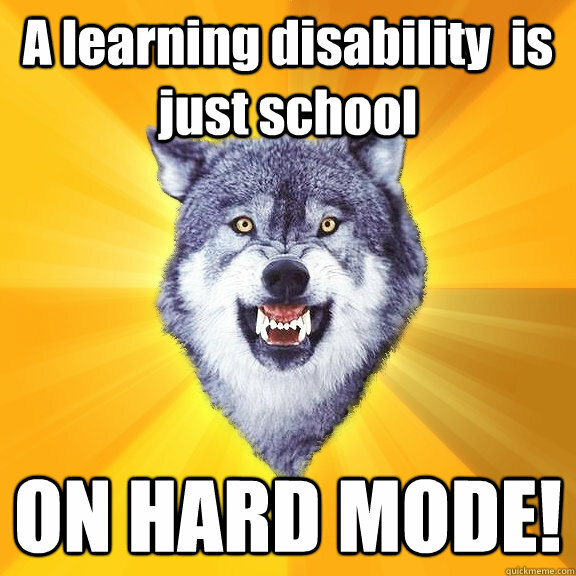 This entry was posted in ADHD + learning disabilities and tagged ADHD, learning disability. Bookmark the permalink. ← modify the process, not the outcome. Yay people being nice and accommodating! I wonder if Canadians (<3) are particularly good at that and what it's like in other countries. I have friends here in Israel with various learning and other disabilities. And as far as I know, their universities didn't have anything to provide. I think the US is just as good, if not better, than Canada in terms of disability accommodations because they have a lot more legislation in place [and, more people who bother to file lawsuits].